Are you shopping for an attractive and original piece of Jewish jewelry to proudly wear something meaningful? Perhaps you need a gift for an upcoming celebration, such as a tallit for a bar mitzvah or Jewish wedding? Below are some gift suggestions as well as some guidance on what makes an item acceptable (kosher) for use, beyond what you might find in an ordinary (boring) catalogue. The purpose of the tallit is to enable a Jew to fulfill the commandment of tzitzit, namely to wear a four-cornered garment with a tzitzit (specially knotted strings, themselves woven for the purpose of the mitzvah). The question then is, what is the purpose of wearing tzitzit? The code of Jewish law, the Shulchan Aruch, in the volume Orach Chayim 8:8 states that the idea is for a Jew to be reminded of mitzvot constantly, by virtue of there being two tzitziot in front of him and and two behind him. In other words, in any direction a Jew moves - north, south, east or west - i.e. everything he does should be to fulfil G-d's commandments. This may also be why - after dealing with other morning requirements that cannot easily be delayed - this is the first thing a male Jew is commanded to do. As the verse says, "I placed G-d's name before me constantly." The tallit in the Jewish tradition is essentially just a four cornered garment, ideally made of female sheep's wool. Furthermore, a majority of the side needs to be open, i.e. not sown together. That is why a tallit katan, or small talit, qualifies as a tallit that requires tzitzit to be attached to its corners, but a polo shirt - which has four corners - does not qualify as a garment requiring tzitzit to be attached. That is, because the polo shirt is sown closed on the sides, it does not require tzitzit and adding them to a polo shirt would not enable one to fulfil the commandment of tzitzit. - If it has more or fewer than four corners. - If one of the tzitziot tore at the base, the whole tallit is no longer valid. If it's just the end that tore, provided that the remaining length is sufficiently long (12 thumbwidths, measured at the knuckle), it remains kosher. https://www.judaicawebstore.com/-traditional-pure-wool-tallit-white-P5045.aspx - This pure white tallit recalls G-d's surrounding protection, which is one of the deeper meanings of the tallit. https://www.judaicawebstore.com/-traditional-pure-wool-tallit-black-P5029.aspx - The black stripes recall the day of death, encouraging a Jew to be humble and repent as if this moment was his last chance. 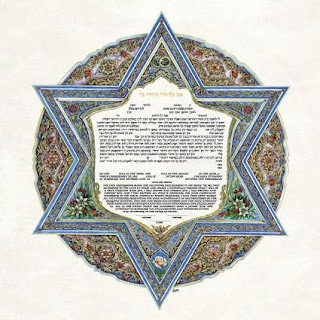 The ketubah is - contrary to popular thought - not a pre-nuptial agreement, but rather the actual marriage contract. Its importance to the wedding ceremony is central, because without a ketubah there is no valid marriage. So what does the ketubah say? Primarily, it states the husband's obligations towards his wife during the marriage, as well as the money he needs to pay her upon divorce or his passing. By creating a financial burden for divorcing, the Rabbis prevented temperamental husbands from divorcing their wives in a fit of anger. Of course, there are some conditions where this protection does not avail, such as where the wife committed adultery. In that case she is not paid the amount stated in the ketubah. After a husband has passed on, the ketubah payment falls to his heirs. His wife is entitled to continue living in their marital home, as well as to payments for her outgoings (e.g. food, clothing) as during the marriage, or she can get the ketubah's payment as a lump sum immediately. Once the heirs have paid off the ketubah, they take possession of the document as proof that they have paid off the debt. That is, it functions as a receipt. It's well known that story of Hanukkah focuses on the military victory of the Hasmoneans, lead by Judah Maccabi, over the Syrian-Greek army. The Greek empire sought to impose idolatry and prohibit Judaism, defiling the Temple and installing an idol there as part of their war against Judaism. What is less well known is that each of the Rabbinically instituted holidays, such as Hanukkah, corresponds to one of the Biblically instituted holidays, as explained in the Torah commentary, Sfat Emet. Indeed, the Rabbinically instituted holidays always start on the same day of the week as their corresponding Biblical holiday. 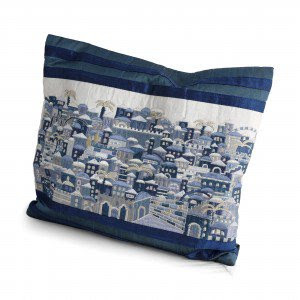 Hannukkah echoes the holiday of Sukkot. Both are eight days long. Both feature recital of the full Hallel prayer. There are additional parallels (see here, in Hebrew). Given that the miracle of the Temple menorah was that the small vial of olive oil lasted for 8 days instead of one, the ideal way to fulfill the mitzvah of Hanukkah is to light a Hanukkah menorah with olive oil and wicks as in the Temple. This replica of an Algerian Hanukkah menorah looks very similar to the one my mother, who is from Morocco, lights. The wicks lie horizontally, rather than standing upright, and the menorah can be hung on a nail or two outside for the sake of publicizing the miracle, and during the year on a nail over the mantle. It feels very authentic to me. 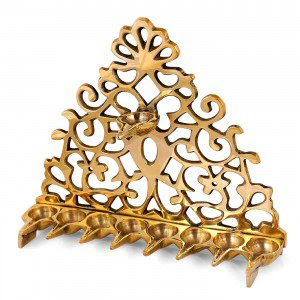 https://www.judaicawebstore.com/Israel-Museum-Hanukkah-Menorah---19th-Century-Morocco-Adaptation-Choice-of-Colors-.aspx A similar North African style features engraved brass with the words BeSiman Tov - under a good sign, also traditionally stated at the start of reading the Torah, on Simchat Torah. Comes with cups into which you pour the oil and place the wicks. https://www.judaicawebstore.com/lins-farm-all-natural-extra-virgin-olive-oil-dressing-250g-P12980.aspx - Pure, extra virgin olive oil, despite the misnomer "dressing" in the product name. If you read the Hebrew in the label, it just says extra virgin, pure olive oil. https://www.judaicawebstore.com/set-of-44-pre-filled-gelled-olive-oil-cups-for-hanukkah-medium-P7409.aspx - For those who prefer pre-filled oil cups (90% pure olive oil, 10% parrafin to keep the oil solid until it burns, thus avoiding mess). Also, this ensures you fulfil the mitzvah as opposed to risking pouring too little oil, causing the fire to extinguish before a half hour has passed from the time the stars are out. (The fulfilment of the mitzvah requires the fire to burn until a half hour after the halachic time known as "the emergence of the stars" i.e. once three stars are visible). Medium size. Check your menorah before buying.